The Sterling and Franklin deposits are fabulously rich in zinc (more than 20%) by weight, and also in iron and manganese. Both deposits are quite large: the Sterling mine in Ogdensburg produced more than 11 million tons of zinc ore, and that at Franklin twice as much. More than 365 different mineral species have been found in these two mines, placing the Franklin-Ogdensburg area in the top five most mineralogically complex localities on Earth. Zinc has been used since the 10th century BC, primarily for making brass, a copper-zinc alloy. Today, it has many uses including, plating steel to prevent corrosion (galvanizing), and manufacturing batteries, paint and other consumer products. Mining of our local zinc deposits began sometime before 1739, but exactly when and by whom is no longer known. However, because none of the three principal ore minerals (franklinite, willemite, and zincite) were as yet known to science, they had no way of understanding the nature of these deposits. Since then the number of scientific publications related in some way to these mines has grown to more than 1,000. Yet, despite more than 200 years of scientific inquiry, only recently has a consensus emerged on their origin. The zinc minerals at Franklin and Ogdensburg are wholly encased in a geologic unit called the Franklin Marble, which underlies much of the Wallkill River valley between Sparta, New Jersey on the southwest and Warwick, New York on the northeast and is about 1.3 billion years old. These unique deposits are exceptionally rich in zinc and no similar deposits have been found anywhere else on Earth. It is now generally accepted that the ore deposits at Franklin and Sterling Hill originated as hot, metal-rich fluids that were discharged onto the floor of a shallow sea about 1.3 billion years ago. The sea floor at that time was covered by white calcium carbonate muds, similar in many respects to the Bahama Banks today. 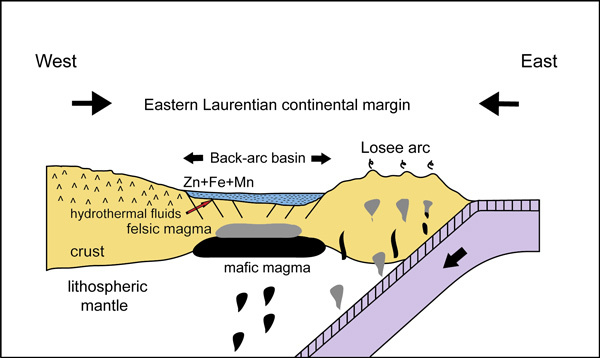 In the illustration below, we see, in cross section, an oceanic plate at right colliding with a continental plate at left, which created fractures in the rock. Because oceanic crust is significantly denser than continental crust, the result of such a collision is that the continental plate overrides the oceanic plate, which then dives or “subducts” beneath the continental plate. Partial melting of the oceanic plate as it descends beneath the continental plate gives rise to a chain of volcanoes, which form from different kinds of magma (melted rock). When the magma reaches the surface through the fracture zones, it is called lava, which, depending on the minerals can range in color from black basalt (mafic) to very light granite (felsic). Mafic magma is rich in iron and magnesium and denser than felsic magma, which is rich in silica and aluminum. Hot, metal-rich fluids (hydrothermal fluids in the illustration) also ascended and erupted onto the sea floor, and formed layers of metal-rich muds. This was the situation about 1.3 billion years ago, when the carbonate muds and the remarkably high zinc-rich layers within them were first deposited into a shallow sea. Adapted from Volkert, R.A., Aleinikoff, J.N., and Fanning, C.M. (2010), Tectonic, magmatic, and metamorphic history of the New Jersey Highlands: New insights from SHRIMP U-Pb geochronology. Geological Society of America Memoir 206, p. 307-346. As the plates continued to move, a second continental plate collided with the one described above. At that time the Franklin and Sterling zinc deposits were slowly buried, eventually reaching depths of 15-18 km and heated to temperatures of 750º-800º C. The carbonate muds gradually hardened into limestone. As the rocks descended, the heat and pressure increased, gradually changing (metamorphosing) the limestone into marble, and the metal-rich layers into the zinc ore minerals (franklinite, willemite, zincite) we see today within the Franklin Marble at the Sterling Hill Mining Museum. Mining of our local zinc deposits began sometime before 1739, but exactly when and by whom is no longer known. Those early miners must have gazed in wonder at the strange ores they had uncovered in their shallow mine pits. However, because none of the three principal ore minerals (franklinite, willemite, and zincite) were as yet known to science, they had no way of understanding the nature of these deposits, let alone their genesis. It took another 70 years for the first scientific paper to be published on one of these minerals, zincite, in 1810. Since then the number of scientific publications related in some way to these mines has grown to more than 1,000. Yet, despite more than 200 years of scientific inquiry, our understanding of how these deposits came to be is fragmentary. Only recently has a consensus emerged on a conceptual framework for their formation. The zinc deposits at Franklin and Ogdensburg are wholly encased in a geologic unit called the Franklin Marble, which underlies much of the Wallkill River valley between Sparta, New Jersey on the southwest and Warwick, New York on the northeast. The Franklin Marble is about 1.3 billion years old. There was debate for years on whether the zinc deposits are the same age as the marble that encloses them or whether they are younger, but it now appears that they formed at the same time. The orebodies are stratiform, which means that they formed as blanket-like deposits conformable with the layering in the Franklin Marble as a whole, and were folded along with the marble to their present configurations. No similar deposits have been found anywhere else on Earth; they are unique. This limits the ability to infer aspects of their formation by analogy to deposits studied elsewhere. A hypothesis that the zinc ores originated as sediments deposited along with the host limestone and were later metamorphosed to ore minerals and marble was made as early as 1855, but for many years it failed to gain traction. An important step to our modern understanding took place in 1966, when William Callahan, a New Jersey Zinc Company geologist, likened the ores to the metamorphic equivalent of the sediments currently forming in brine pools in the Red Sea. Here we have the beginnings of the volcanic exhalative view of our zinc deposits – namely, that they formed as hot, metalliferous brines erupted onto an ancient sea floor. In this view the ores are syngenetic – that is, they formed at the same time as their host rocks. Research since that time has only strengthened this general concept of the origin of the ores. Over the last two decades, the New Jersey Highlands have been thoroughly remapped by geologists of the New Jersey Geological Survey. The new detailed maps, combined with carbon and oxygen isotopic studies and a series of precise age determinations to put the rock units in proper chronological context, have produced a conceptual plate-tectonic model of the evolution of the region. It is now generally accepted that the ore deposits at Franklin and Sterling Hill originated as hot, metalliferous brines that were discharged onto the floor of a shallow sea about 1.3 billion years ago. The sea floor at that time was covered by white carbonate muds, similar in many respects to the Bahama Banks today. As the hot brines came into contact with the much colder seawater, the metals dissolved in them precipitated as small particles that then fell to the sea floor, there to accumulate as a series of metal-rich layers within the thick sequence of white carbonate muds. The original mineralogy of these metalliferous layers is still uncertain, but whatever their nature, metamorphism of these original materials gave us the orebodies that we see today. The illustration below depicts the probable plate-tectonic setting at the time of ore deposition. Here we see, in cross section, an oceanic plate at right colliding with a continental plate at left. Because oceanic crust is significantly denser than continental crust, the result of such collision is that the continental plate overrides the oceanic plate, which then dives or “subducts” beneath the continental plate. Partial melting of the oceanic plate as it descends beneath the continental plate gives rise to a chain of volcanoes (the Losee arc) that shed sediment into a shallow sea. The area of the shallow sea is aback-arc basin, a region beneath which the Earth’s crust is being pulled apart. This extension forms fracture zones deep in the crust that allow hot, metalliferous brines to ascend to shallow depths and erupt onto the sea floor, there to form layered deposits of metal-rich muds. This was the situation about 1.3 billion years ago, when the carbonate muds (later to become the Franklin Marble) and the metal-rich layers within them (later to become the zinc orebodies) were first deposited. Source: Volkert, R.A., Aleinikoff, J.N., and Fanning, C.M. (2010), Tectonic, magmatic, and metamorphic history of the New Jersey Highlands: New insights from SHRIMP U-Pb geochronology. Geological Society of America Memoir 206, p. 307-346. About one billion years ago, as the plates continued to move, a second continental plate collided with the one described above. Because continental plates are of about equal density, their collision resulted not in one plate sinking beneath the other, but with both plates crumpling, splintering, and interleaving along the collision boundary. The result of these crumpled continental edges was a mountain chain, similar to the Himalayan Mountains we see today, where the Eurasian plate is colliding with the Indian plate. Along the collision boundary, some of the rocks that had been near the surface became deeply buried and metamorphosed under the high pressures and temperatures that exist deep within the Earth. The Franklin and Sterling zinc deposits were buried to depths of 15-18 km and heated to temperatures of 750º-800º C, which radically changed their original minerals to those we see today. That grand event of continental collision, burial, and heating is called the Ottowan Orogeny (the terminal orogeny of the Grenville Orogenic Cycle), and it affected most of the rocks now exposed at the surface in northern New Jersey. Rocks similarly affected can be followed northeastward into New England, as far as Vermont, and southwestward into Pennsylvania, Maryland, and Virginia. Events since that time – that is, during the last billion years of Earth history – have also dramatically affected our local rocks. Since their formation, they have been altered by hydrothermal (hot water) solutions, repeatedly broken by several periods of faulting, invaded by pegmatitic magmas, uplifted to the surface by erosion of the overlying rocks, glaciated during the Pleistocene Epoch, and subjected to prolonged weathering as rainwater descended into the rocks and altered them yet again. The result is one of the most geologically and mineralogically complex and fascinating localities on Earth.